Broadside, "To the Mechanics and Working-Men of the Fifth Ward, And those friendly to their Interests," Philadelphia, PA, 1829. During the uncertain economic times of the 1820s, a lively print culture arose in working class circles. Although books and pamphlets were prohibitively expensive for most Pennsylvania workers, broadsides like this could be posted in a public place for all to read freely. 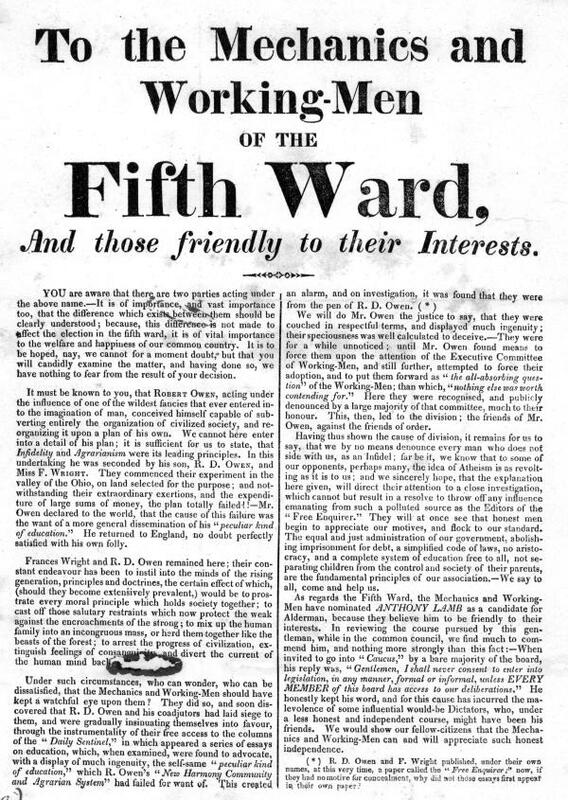 In this broadside, the Mechanics and Working Men of the Fifth Ward condemn the utopian beliefs of Robert Owens, the founder of the New Harmony Community in Indiana, and ask the men of the Fifth Ward to vote for Anthony Lamb for alderman.